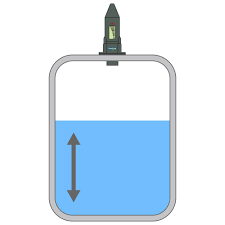 The goal of the project was to predict the level of fluid in a tank based on the data returned from the sensor connected to the tank after the strike is generated by a specific device. The data provided by the client contains information returned by sensors at different various tank levels. After applying the principle component analysis (PCA) to extract patterns from signals at the spectral domain, a simple logistic regression model was created. The model demonstrated good attributes/results and was used for prediction levels with a 98%-100% accuracy.